How do life-changing experiences concretely impact the way we look? Does tragedy truly show up in our eyes and brow? 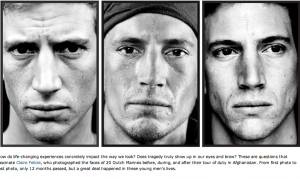 These are questions that fascinate Claire Felicie, who photographed the faces of 20 Dutch Marines before, during, and after their tour of duty in Afghanistan. From first photo to last photo, only 12 months passed, but a great deal happened in these young men’s lives. What’s interesting about this project is that you can convince yourself that someone changed dramatically from middle to right, only to compare right to left and talk yourself out of it. It must just be angle or lighting, you say. But even after you’ve concluded that wrinkle isn’t really any bigger, it’s undeniable that there is a difference. No this was not a perfectly controlled scientific experiment, but there is no science to walking into a room, looking into a friend’s face, and immediately knowing that something has happened. It’s not about the obvious clues like a frown or matted hair, but something far more nuanced. Felicie came up with the idea for this project when her 18-year-old son decided to join the Marines. He was eager to go to Afghanistan and she spent lots of time thinking about how the experience might change him. In the end he never went— instead getting stationed in the Caribbean—but she did. Through one of his friends, she connected with a squad that was being sent to Afghanistan. She photographed them first while they were still on base in the Netherlands; a lingering shoot full of stories of their families and eagerness to depart. Nine months later, just six weeks after they lost two of their men to an IED blast, she met up with them in Afghanistan. The photo session was rushed. The men had just returned from patrol, drenched in sweat, and were eager to shower. She had time for just one portrait of each Marine. She caught them again three months later, when they’d returned to the Netherlands. Again, they had plenty of time, but something was different.